​Manchester City's Vincent Kompany appeared to have a message for Mohamed Salah after his crunching tackle at the Etihad Stadium on Thursday. 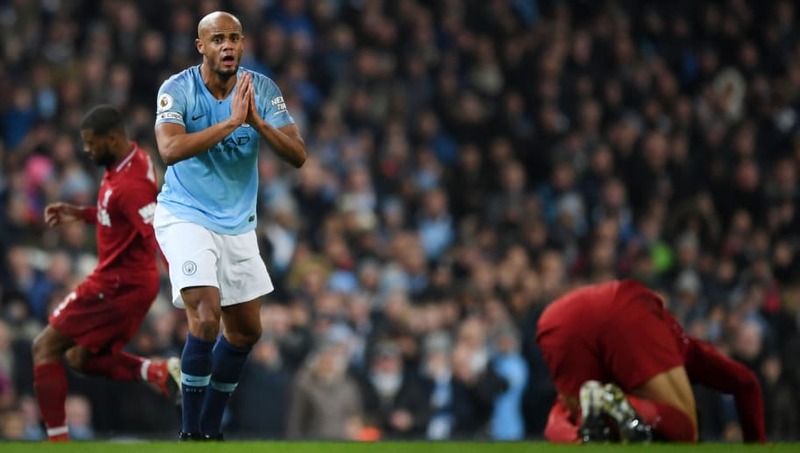 Kompany received a yellow card from referee Anthony Taylor after his crunching lunge left Salah in a crumpled pile in the middle of the pitch, with many believing the Belgian should've seen red - including former Premier League referee ​Mark Clattenburg. After noting his caution, ​Kompany appeared to mock Salah whilst he was on the floor, who has received similar treatment from Real Madrid's Sergio Ramos after last seasons Champions League final, and it just seems ​Salah rubs defenders up the wrong way. The ​Manchester City defender appeared to mutter something in Salah's direction and the eagle-eyed fans of twitter believe they know what the Belgian said. One Twitter post read: "Kompany definitely said 'get up you p***y' to Salah then." Kompany eventually asked to be substituted towards the end of the game, which once again caught the attention of twitter. ​​The Premier League title race is really hotting up now as City closed the gap to four points behind league leaders ​Liverpool, and with 17 games to go there's sure to be many more heated moments before the final conclusion of the 2018/19 season, and here at 90min were sure twitter will capture it all.